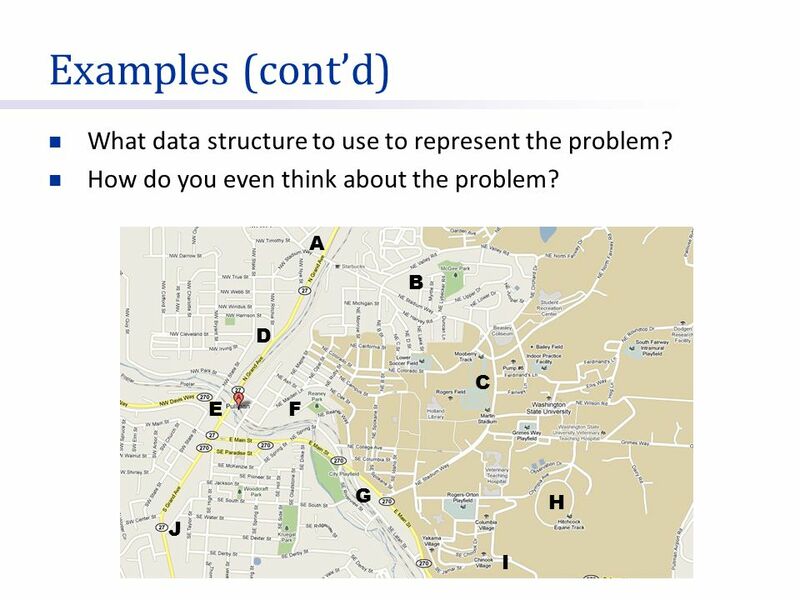 4 Examples (cont’d) What data structure to use to represent the problem? 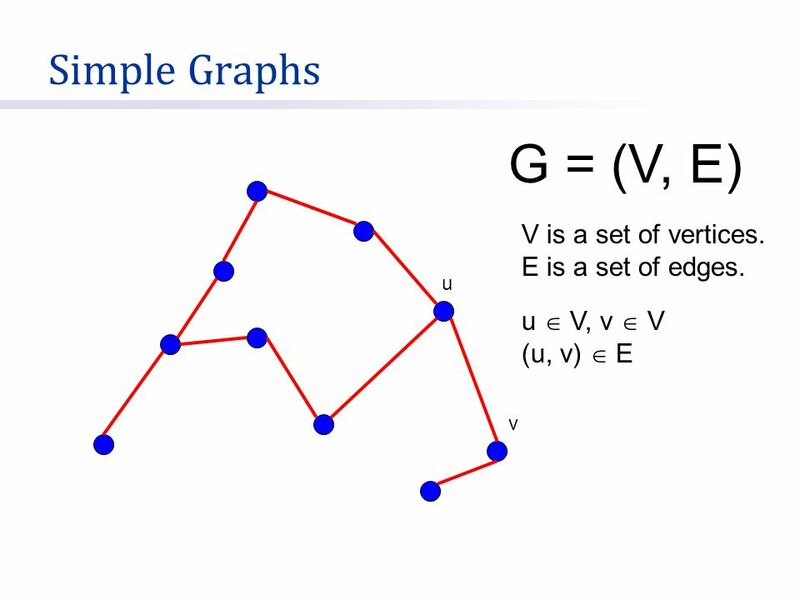 10 G = (V, E) Simple Graphs V is a set of vertices. 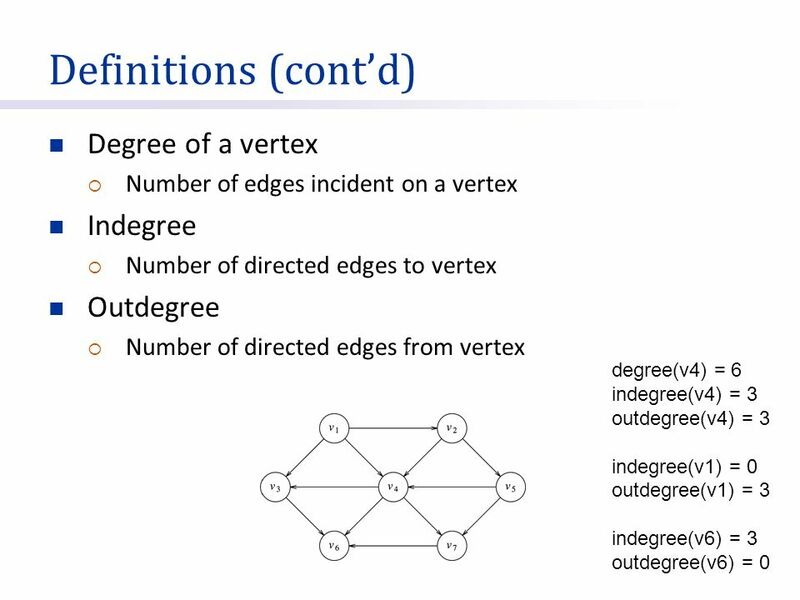 E is a set of edges. 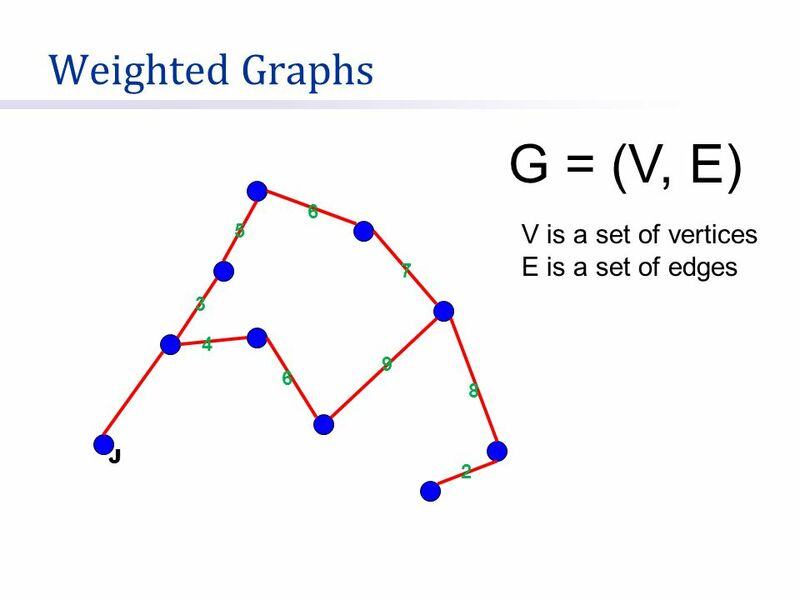 11 G = (V, E) Directed Graphs V is a set of vertices. 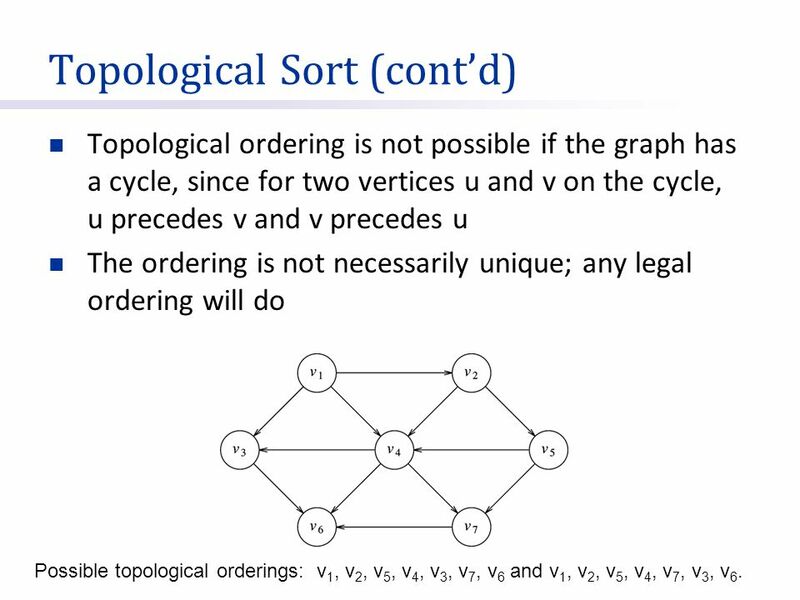 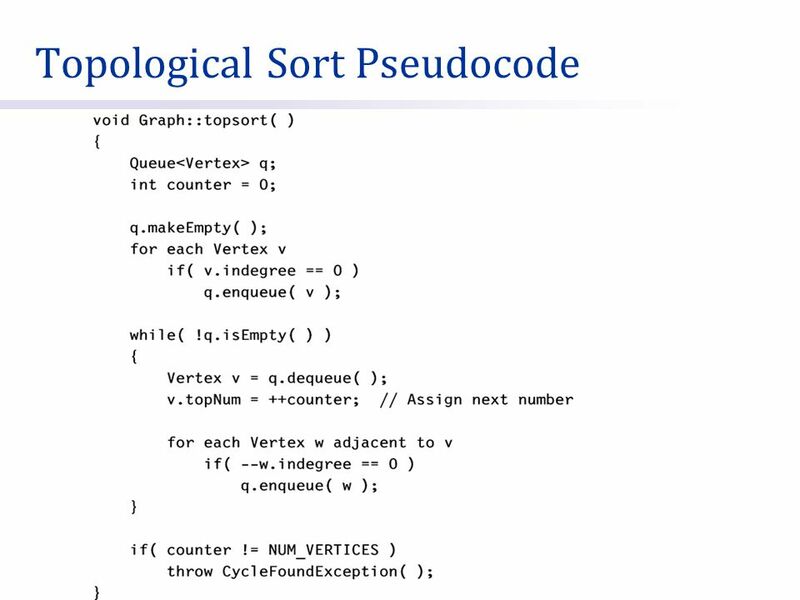 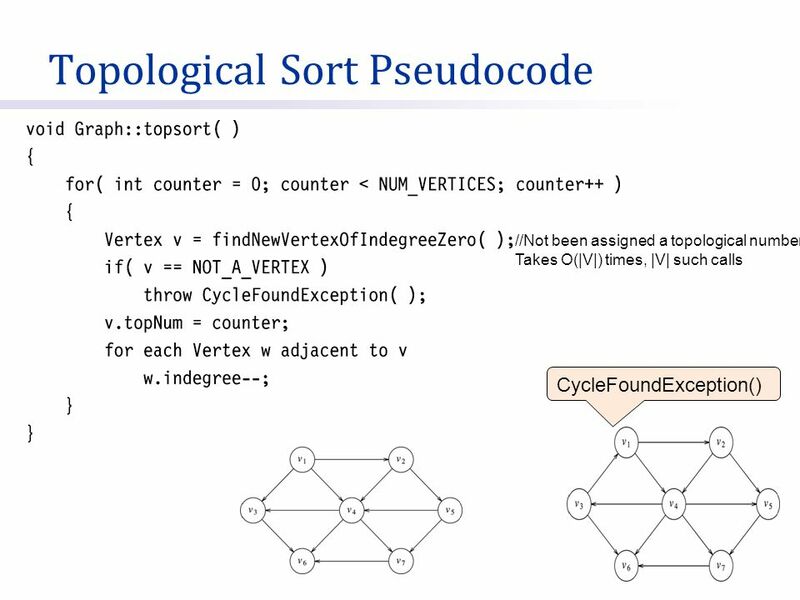 Topological ordering is not possible if the graph has a cycle, since for two vertices u and v on the cycle, u precedes v and v precedes u The ordering is not necessarily unique; any legal ordering will do Possible topological orderings: v1, v2, v5, v4, v3, v7, v6 and v1, v2, v5, v4, v7, v3, v6. 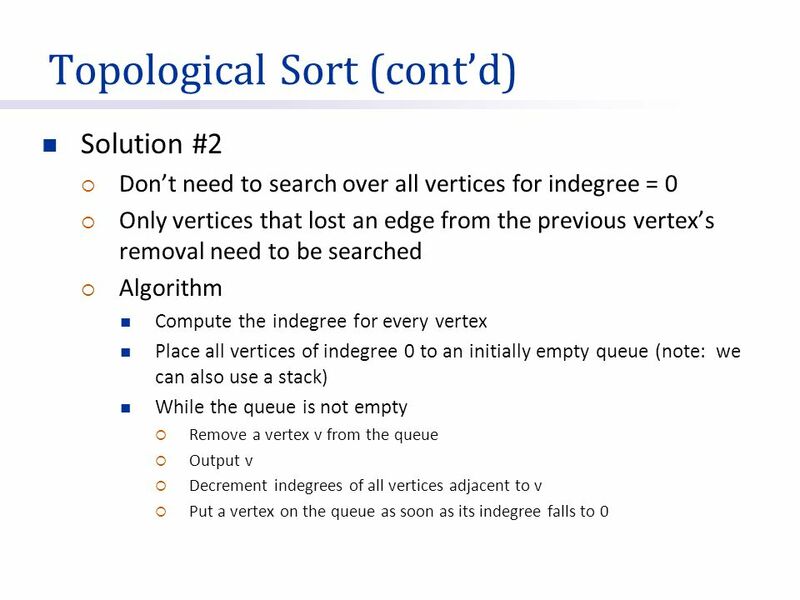 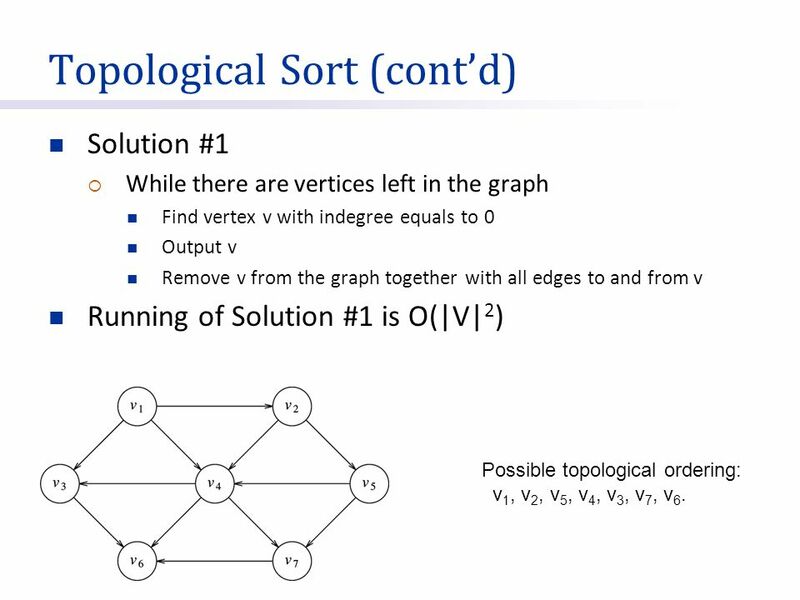 Solution #1 While there are vertices left in the graph Find vertex v with indegree equals to 0 Output v Remove v from the graph together with all edges to and from v Running of Solution #1 is O(|V|2) Possible topological ordering: v1, v2, v5, v4, v3, v7, v6. 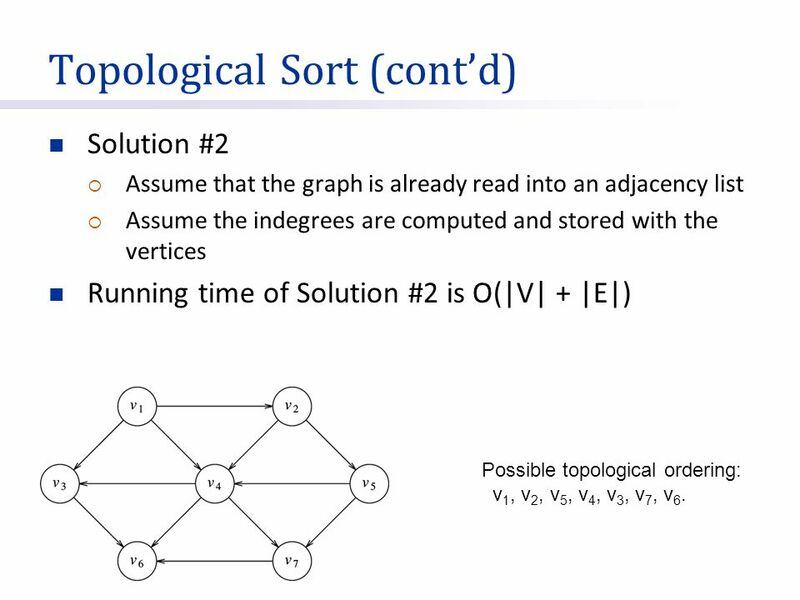 Solution #2 Assume that the graph is already read into an adjacency list Assume the indegrees are computed and stored with the vertices Running time of Solution #2 is O(|V| + |E|) Possible topological ordering: v1, v2, v5, v4, v3, v7, v6. 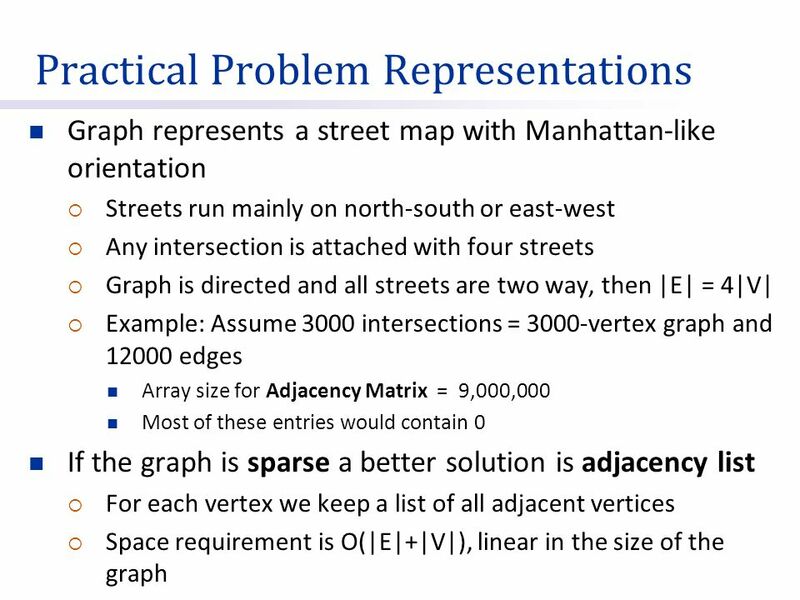 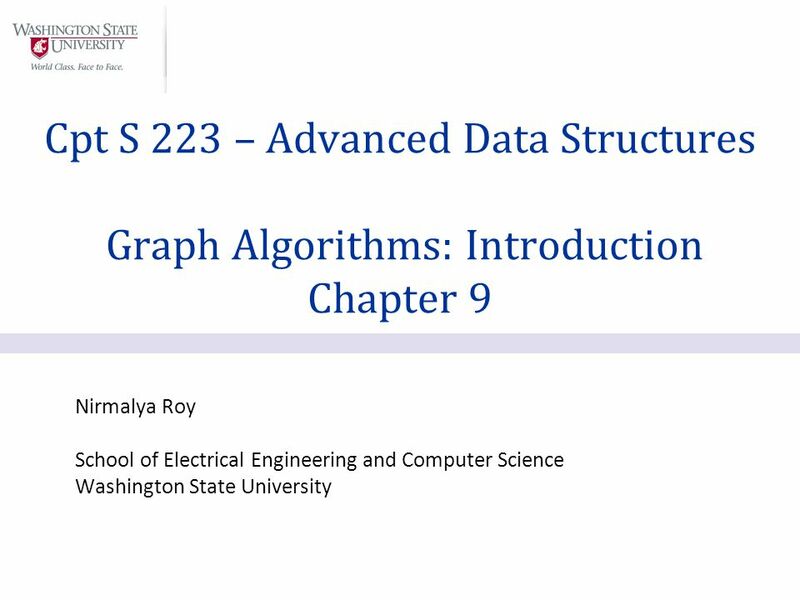 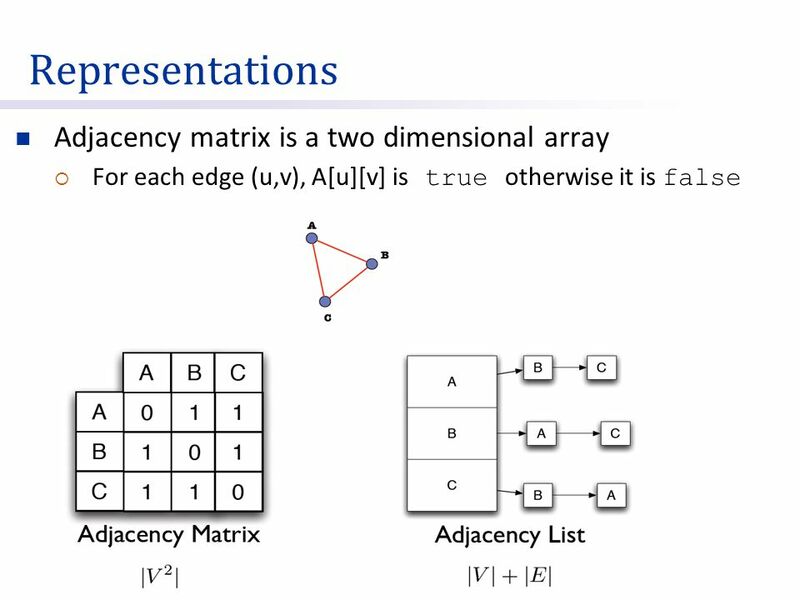 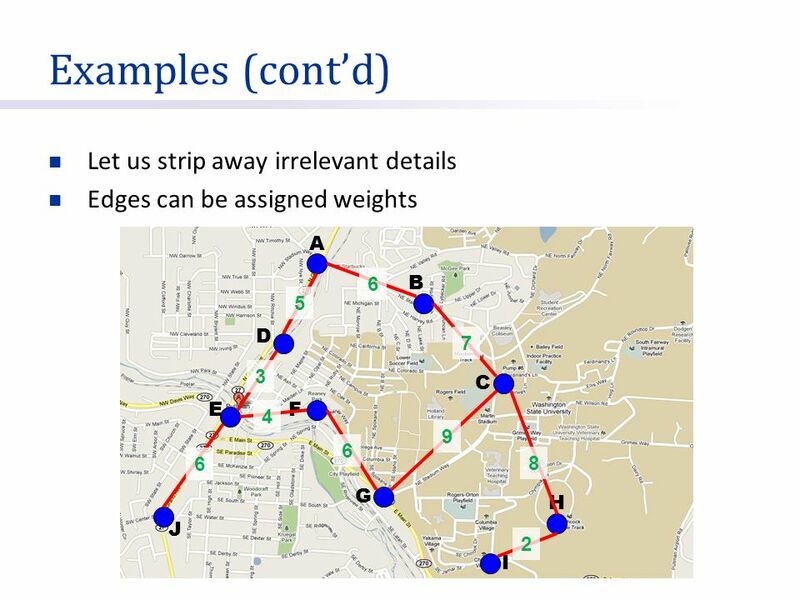 Download ppt "Cpt S 223 – Advanced Data Structures Graph Algorithms: Introduction"
IKI 10100: Data Structures & Algorithms Ruli Manurung (acknowledgments to Denny & Ade Azurat) 1 Fasilkom UI Ruli Manurung (Fasilkom UI)IKI10100: Lecture10. 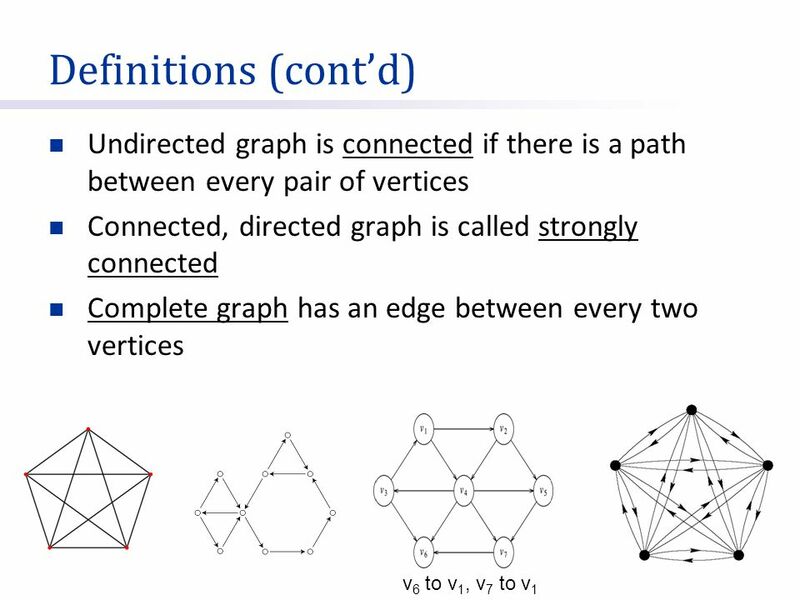 Graphs Chapter 12. 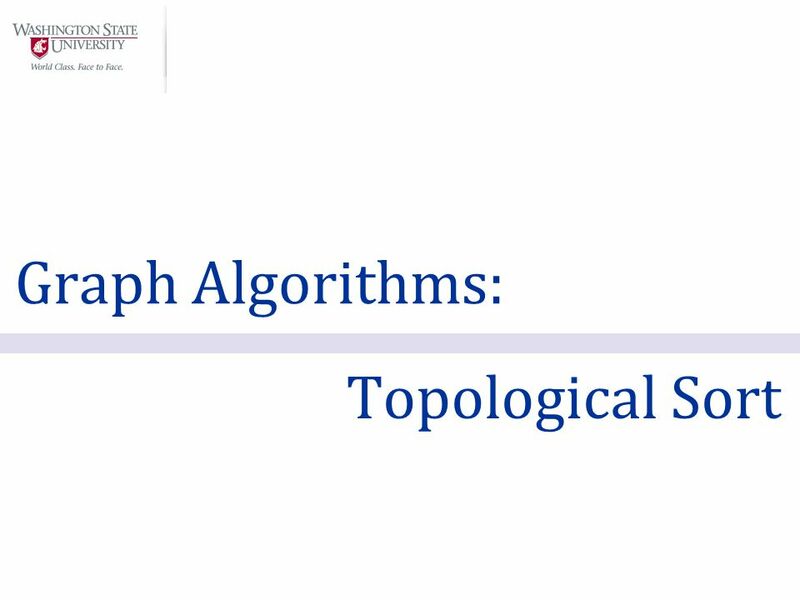 Chapter Objectives  To become familiar with graph terminology and the different types of graphs  To study a Graph ADT and different. 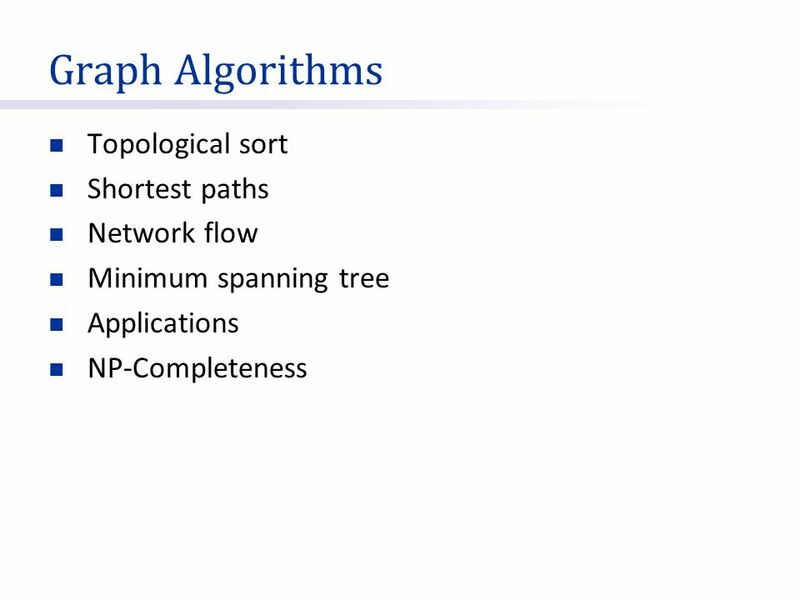  Graph Graph  Types of Graphs Types of Graphs  Data Structures to Store Graphs Data Structures to Store Graphs  Graph Definitions Graph Definitions. 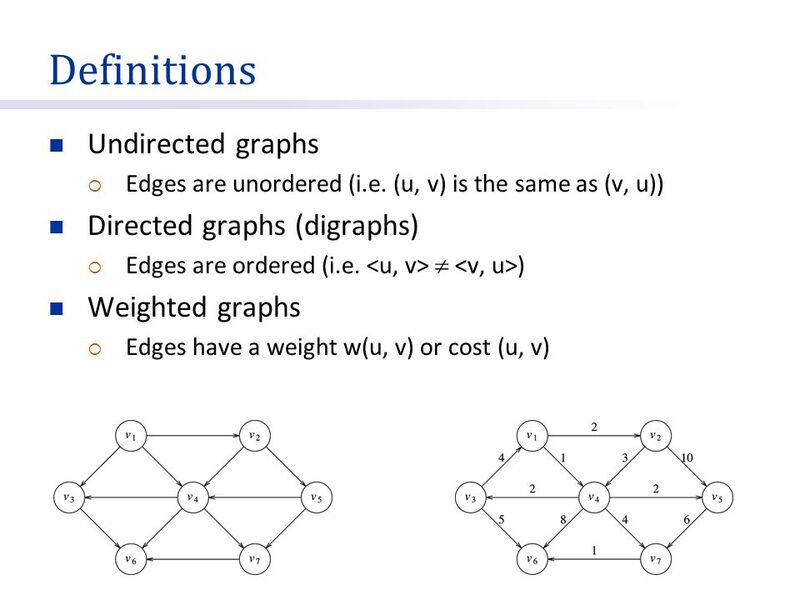 C++ Programming: Program Design Including Data Structures, Third Edition Chapter 21: Graphs. 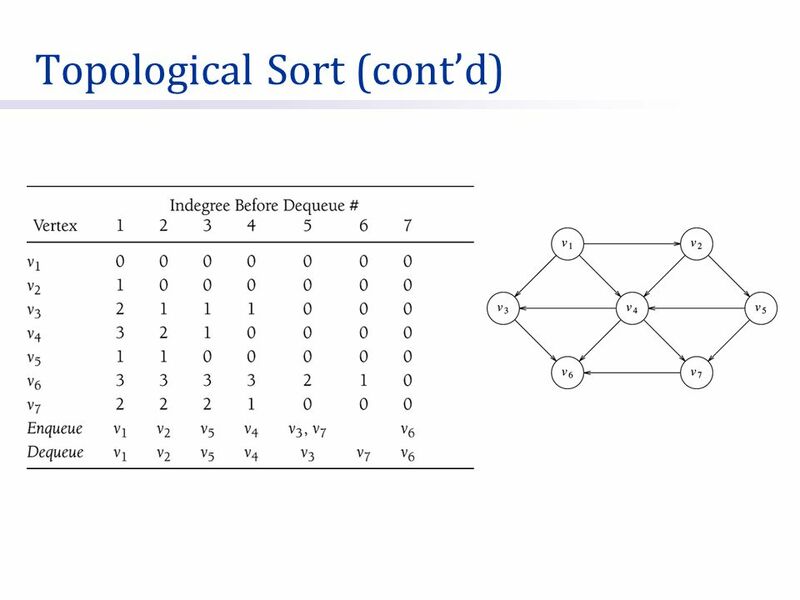 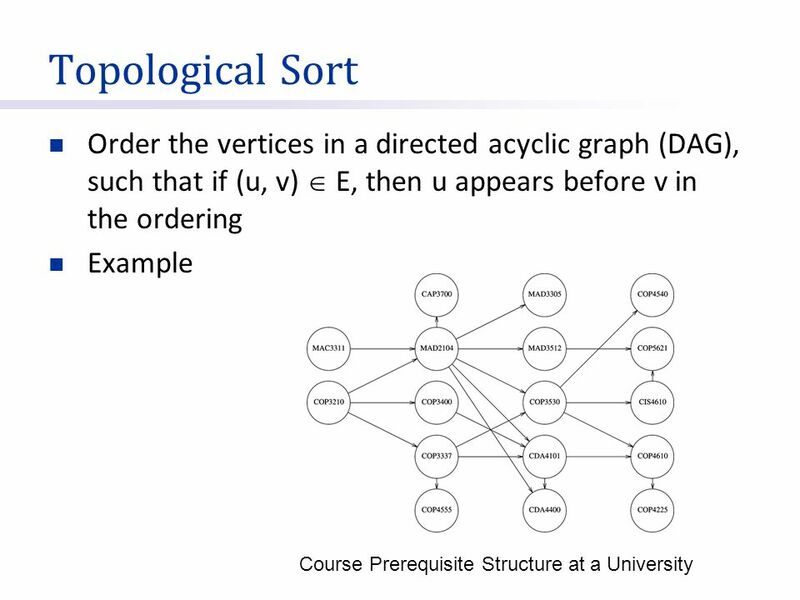 Connected Components, Directed Graphs, Topological Sort COMP171. 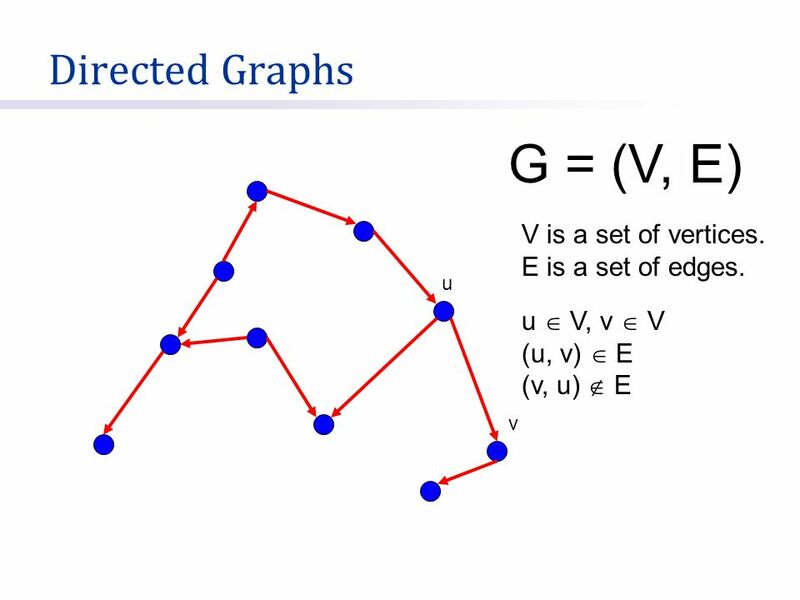 Graph COMP171 Fall Graph / Slide 2 Graphs * Extremely useful tool in modeling problems * Consist of: n Vertices n Edges D E A C F B Vertex Edge. 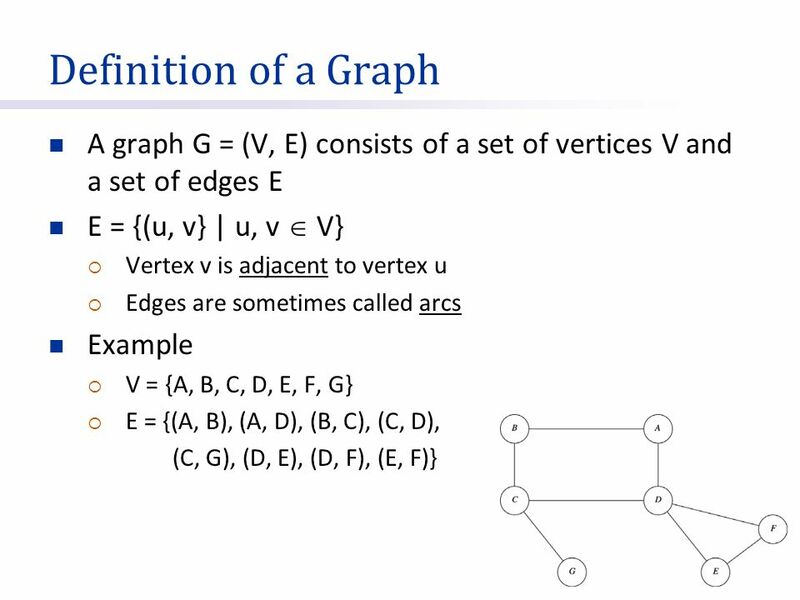 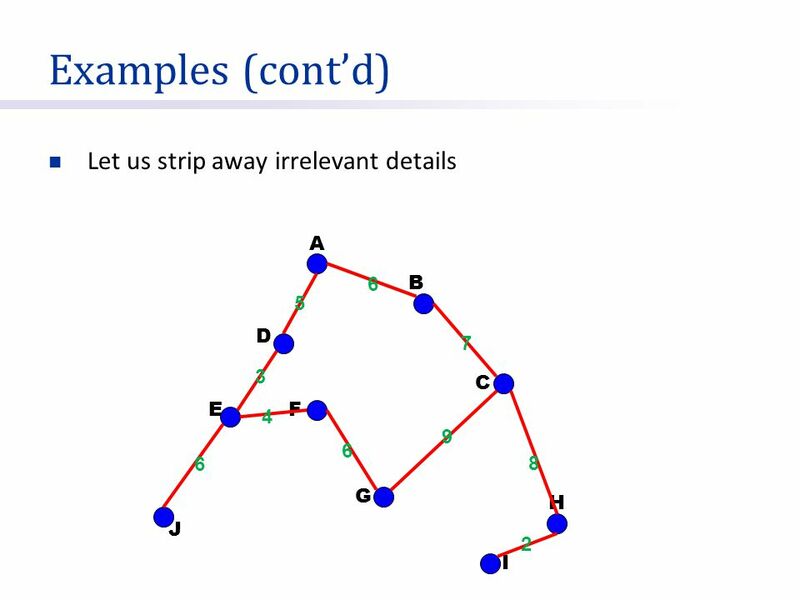 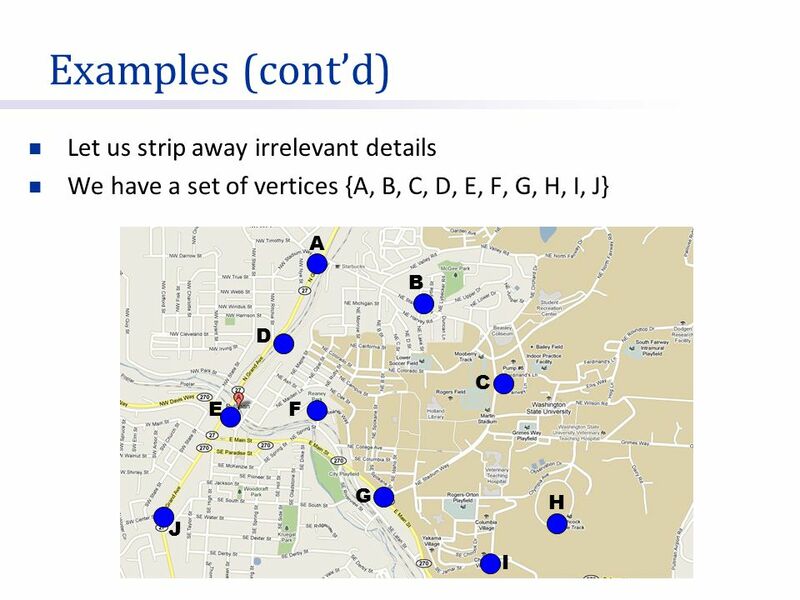 Graph & BFS Lecture 22 COMP171 Fall Graph & BFS / Slide 2 Graphs * Extremely useful tool in modeling problems * Consist of: n Vertices n Edges D.
Graphs Chapter 12. 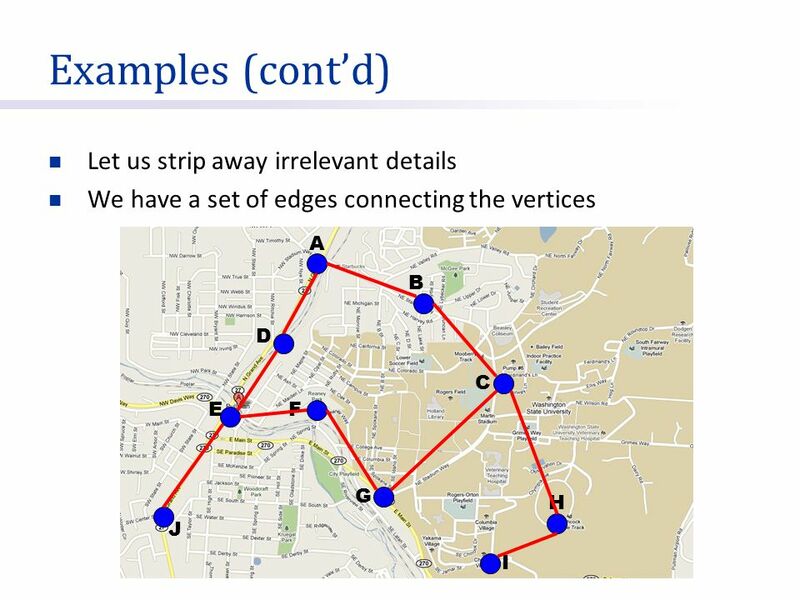 Chapter 12: Graphs2 Chapter Objectives To become familiar with graph terminology and the different types of graphs To study a Graph. 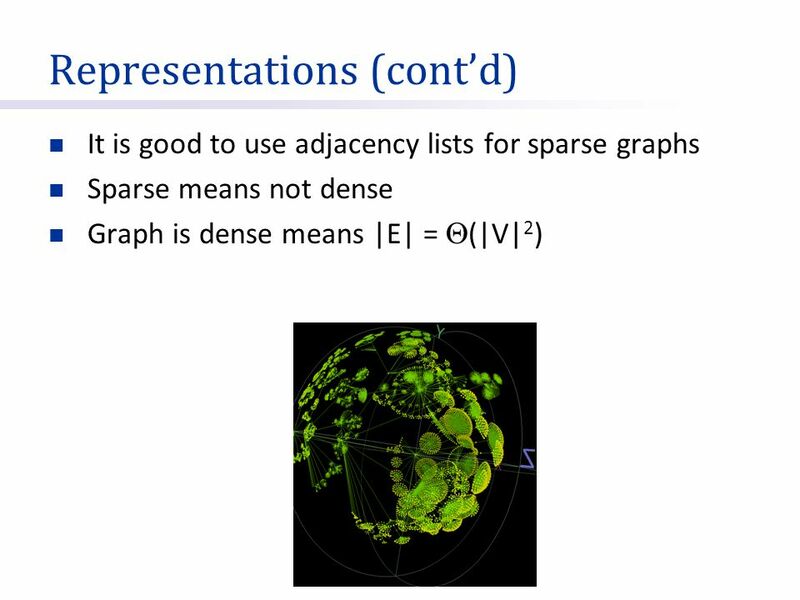 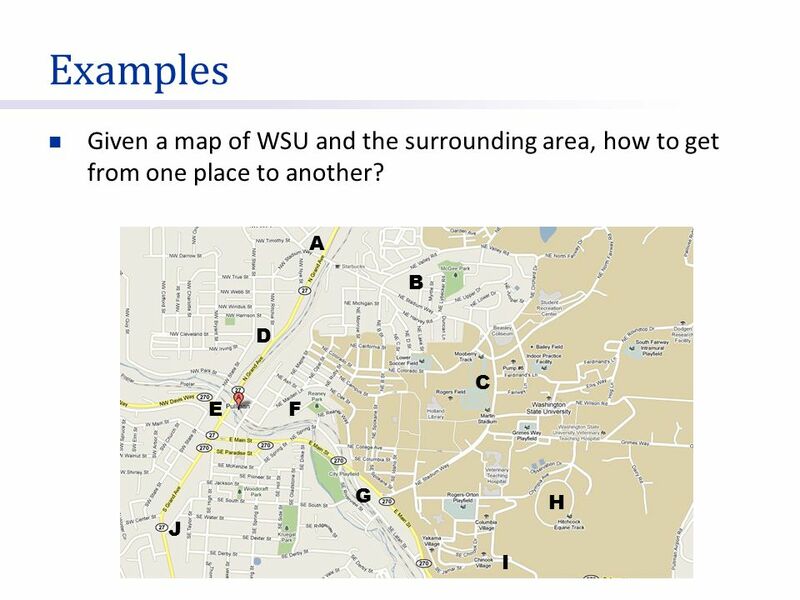 Spring 2010CS 2251 Graphs Chapter 10. 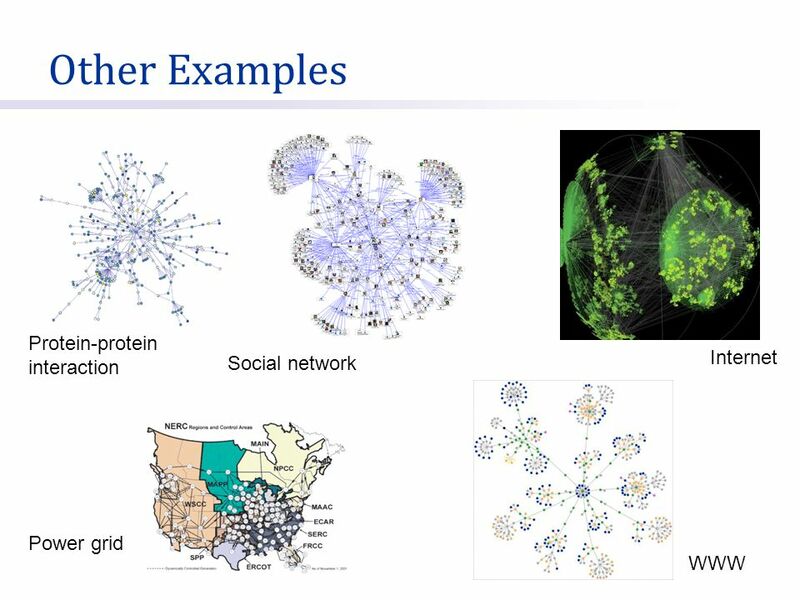 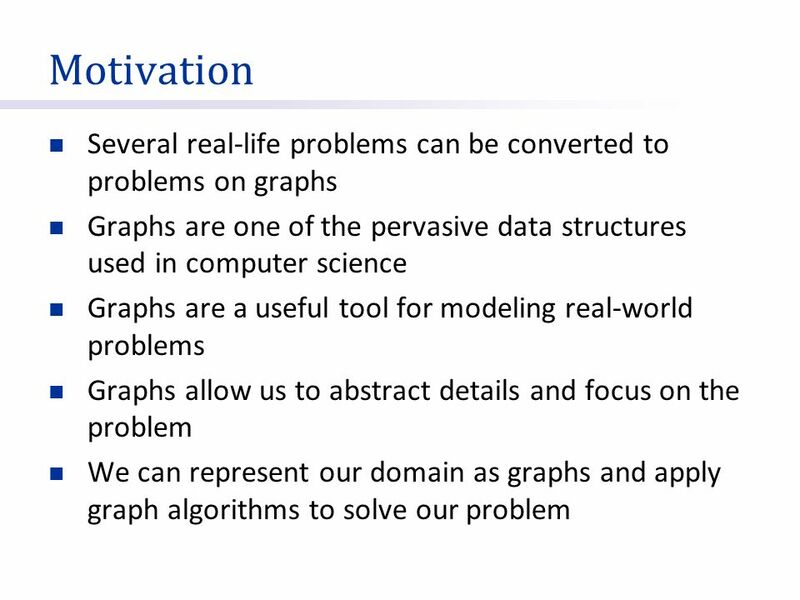 Spring 2010CS 2252 Chapter Objectives To become familiar with graph terminology and the different types of graphs. 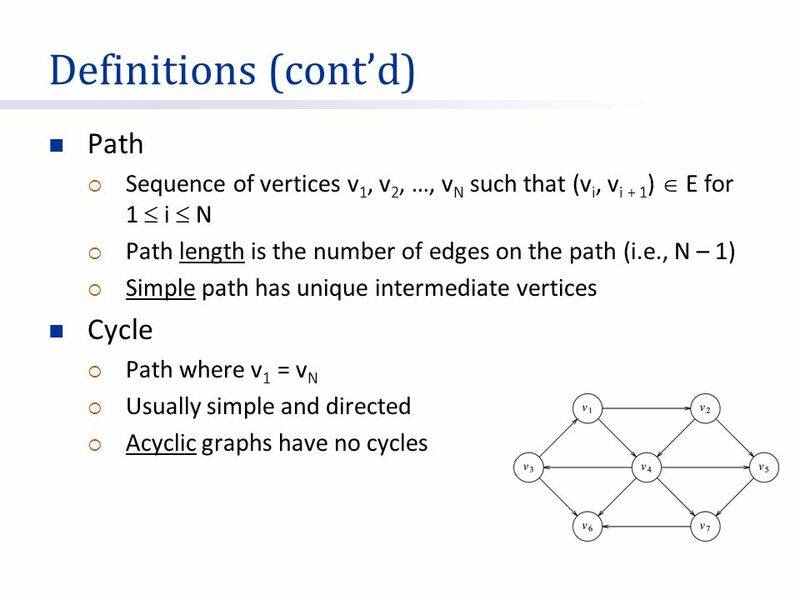 CS 206 Introduction to Computer Science II 11 / 03 / 2008 Instructor: Michael Eckmann.